Hillsboro Vision Clinic (Hillsboro) - Book Appointment Online! If the appointment times listed don't work with your schedule please contact us for additional options. We look forward to hearing from you. 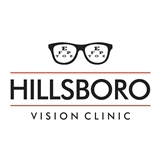 Welcome to Hillsboro Vision Clinic, serving the greater Hillsboro community since 1987. We provide the full range of optometric care including: eye exams glasses & contact lenses diagnosis & treatment of eye diseases & injuries You can expect outstanding patient care and excellent customer service from the doctors & staff at Hillsboro Vision Clinic. We invite your family into our family of experienced eye care professionals. It will be our pleasure to serve you and we look forward to your next visit. This was my first ever eye exam (and I am in my mid-40's). The whole office took great care of me, from the initial paperwork, to the first sets of tests to seeing the Dr. ad going through everything with her. I HIGHLY recommend going here.